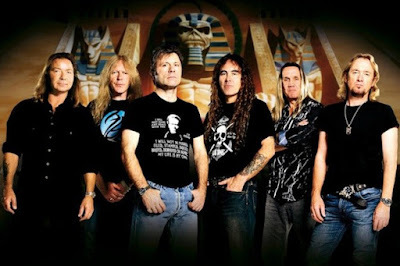 MetalRockNews: Iron Maiden talks about the making of new album "The Book Of Souls"
Iron Maiden talks about the making of new album "The Book Of Souls"
Iron Maiden guitarists Dave Murray and Adrian Smith recently talked with Total Guitar magazine about the making of the band's new album, "The Book Of Souls", which will be released on September 4. You can read some excerpts below. Dave Murray said: "On previous albums we've usually gone into a rehearsal room for maybe a couple of weeks and maybe have four or five songs under our belts. Then we'd go into the studio and start recording, and the rest of the material would be written while we were there. But this time we went in there with a blank page and a bunch of ideas. It was a really fun experience because it keeps you on your toes. You have to be really sharp. We're scribbling guitar chords down, melodies and harmonies, changes… Basically, we were flying by the seat of our pants because we never knew what was coming next. But it was wonderful how things kept flowing." "The Book Of Souls" will include "Empire Of The Clouds", an 18-minute track penned by singer Bruce Dickinson. The CD was recorded in Paris, France with producer Kevin "Caveman" Shirley in late 2014, with the finishing touches added earlier this year. Adrian Smith said: "Bruce was working on 'Empire Of The Clouds' for about a month on his own. Every single day we'd be in the studio blasting out stuff and he'd be in the soundproof glass booth playing piano. Like Beethoven with his ear to the piano, concocting this masterpiece. I think he wrote every single note in it. We interpreted it and we did it in sections. Kevin and Bruce would be in the control room and say, 'That's too bluesy, can you make it a bit more classical sounding?' He recorded all the piano from start to finish and then we played along to that. Then I think they put on all the orchestration afterwards. It's a bit of a story on its own that one."